Our new vSecure Terminal allows you to accept card payments, anywhere in the world, with a computer and an internet connection. Online reporting will store all transaction and order information. Card payment information can either be entered manually or we offer the vSecure Swipe for swiping capability. Now there is a virtual terminal available that has been designed by the merchant and priced with them in mind. Our vSecure Terminal will always be updated with the most current security compliances and technology. Tokenization allows cardholder data to be stored within our secure servers. A merchant can process transactions by simply passing a token value representing a carholder and credit card information. Using the token simplifies transaction processing and mitigates data entry errors. Additionally it eliminates the need to store sensitive information in-house so you can focus on growing the business as vSecure Processing focuses on securely processing the transactions. 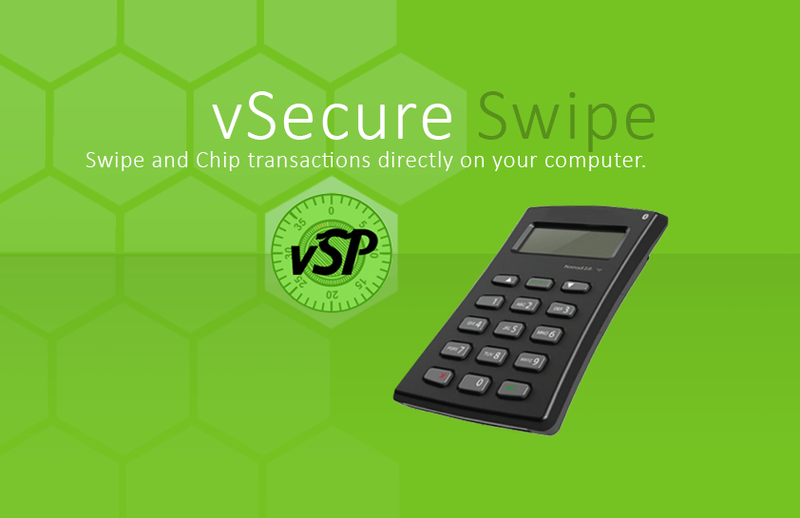 vSecure Swipe is a simple, easy to use payment solution ideal for small to medium sized businesses. Our device allows merchants to process cards on their Virtual Terminal, while getting a SWIPE RATE. vSecure Swipe plugs directly into your computer via USB port. This gives merchants the upmost security when accepting a card payment. The ability to swipe will lower the merchant's processing rate from MID-QUAL to QUALIFIED. As of Oct 1, 2015, all merchants who accept credit cards must be EMV compliant. What is EMV? EMV is a global standard for purchasing or accepting credit cards as payment. EMV cards have a mini microchip processor that interacts with a point of sale system. They have added layers of security that are virtually impossible to duplicate.